Best paleo chocolate cake you will ever have! Made with sweet potatoes instead of flour and avocado chocolate frosting. This flourless and dairy free chocolate cake is made in the food processor and perfect for any celebration! 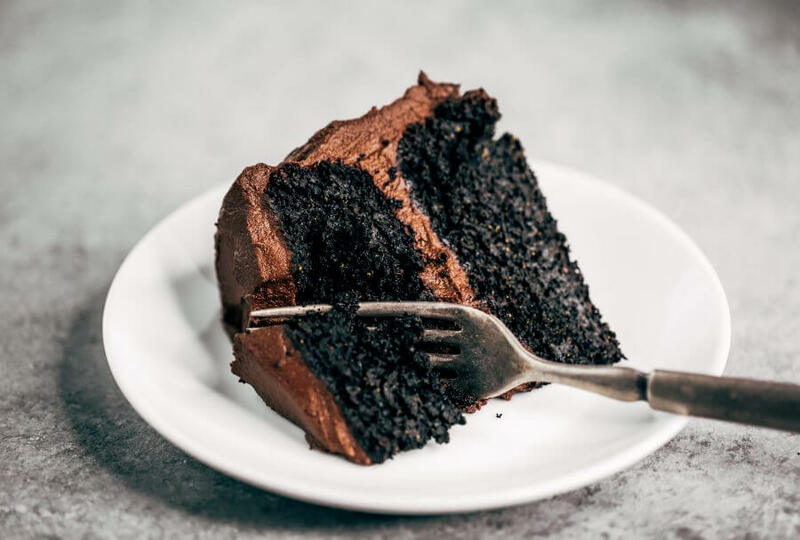 Are you ready for this easy gluten free chocolate cake recipe? Preheat oven to 350F. Line the bottom of two 6" spring form cake pans with rounds of parchment paper. In a food processor mince sweet potato. Then in a blender combine all ingredients for cake until smooth. Divide batter in-between the two cake pans. Bake on 350F for 45-50 minutes, then chill in freezer while you make frosting. For frosting, steam sweet potato cubes, then drain water, and combine with rest of frosting ingredients until smooth (about 5 minutes). Chill until ready to frost. Nutrition Facts Best Paleo Avocado Chocolate Cake Amount Per Serving Calories 372 Calories from Fat 144 % Daily Value* Total Fat 16g 25% Saturated Fat 12g 60% Polyunsaturated Fat 0.4g Monounsaturated Fat 3g Cholesterol 31mg 10% Sodium 338mg 14% Potassium 734mg 21% Total Carbohydrates 58g 19% Dietary Fiber 13g 52% Sugars 30g Protein 9g 18% Vitamin A 197% Vitamin C 4% Calcium 12% Iron 16% * Percent Daily Values are based on a 2000 calorie diet. Best fudgy paleo brownies made with avocado and sweet potatoes! Easy flourless brownies with avocado buttercream frosting! 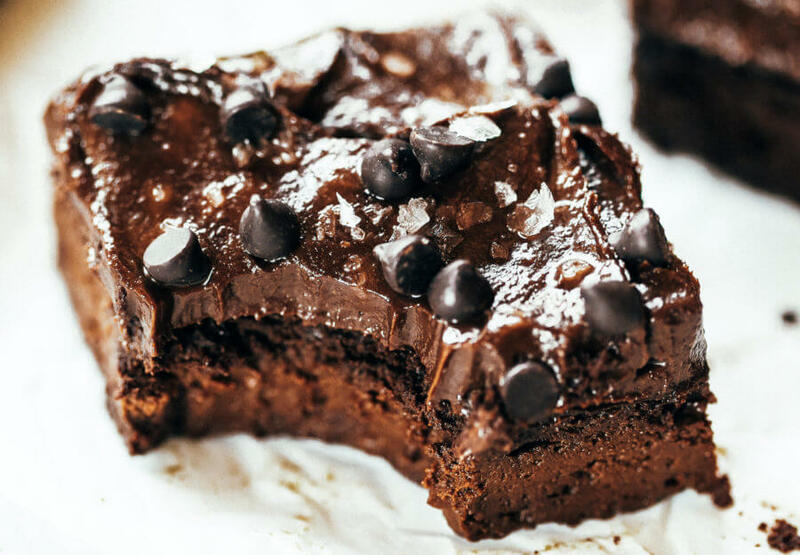 Ultra-rich, veggie-packed, decadent, triple-chocolate, healthy brownies. Make mashed sweet potato by steaming sweet potato chunks, then mashing in a food processor or by hand. Preheat oven to 350F. Line the bottom of a 8" by 8" baking dish with parchment paper. Blend ingredients for frosting in a food processor until smooth, then chill in fridge or freezer until brownies are ready. In a food processor combine ingredients for brownies until smooth. Spread batter into a 8" by 8" baking dish. Bake on 350F for 40 minutes, then cool before frosting. Optional: top with mini chocolate chips. Side note: it's best to store these in the fridge or freezer- I like them frozen! Nutrition Facts Fudgy Avocado Sweet Potato Brownies Amount Per Serving Calories 175 Calories from Fat 63 % Daily Value* Total Fat 7g 11% Saturated Fat 4g 20% Polyunsaturated Fat 1g Monounsaturated Fat 3g Cholesterol 23mg 8% Sodium 227mg 9% Potassium 415mg 12% Total Carbohydrates 24g 8% Dietary Fiber 6g 24% Sugars 14g Protein 5g 10% Vitamin A 49% Vitamin C 9% Calcium 3% Iron 3% * Percent Daily Values are based on a 2000 calorie diet. The easiest paleo gnocchi made with 2 ingredients! 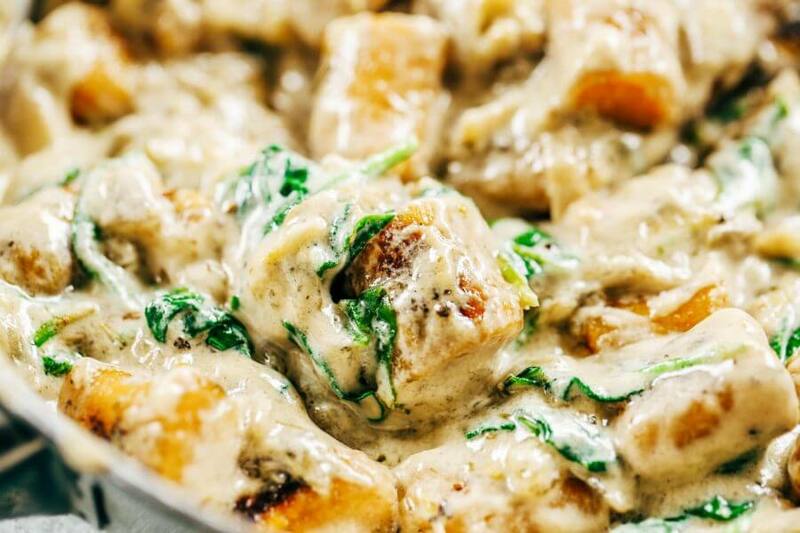 Flourless sweet potato gnocchi served with dairy free spinach cream sauce! 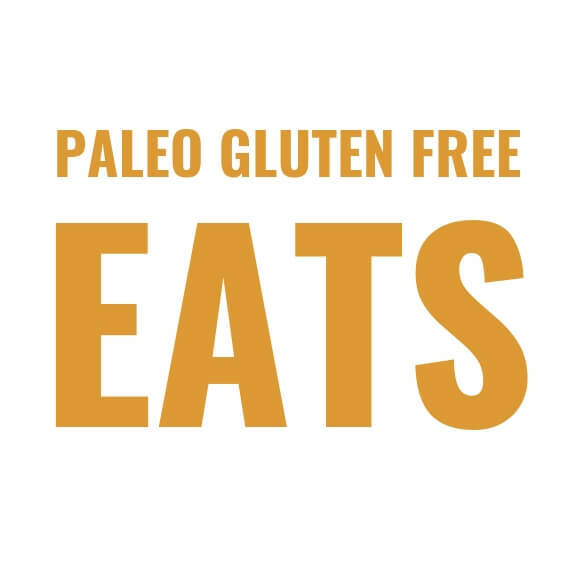 Whole30, paleo, and gluten free. This recipe can be made ahead and frozen. In a bowl stir together the cooked mashed sweet potato and flour (use Anthony's Goods brand to get same results) for the gnocchi until completely smooth. If you don't have cooked sweet potato on hand, make it by peeling a large sweet potato, cutting into 2" chunks, and boiling in water until soft (drain water from sweet potatoes after boiling). Separate dough into four equal parts and roll out into 3/4" diameter tubes on a surface dusted lightly with cassava flour. Cut the tubes of dough into 1" pieces. Bring a large pot of water to a boil and drop gnocchi into it. Once they have risen to the surface, remove, and drizzle lightly with olive oil. Heat a skillet over medium heat and pour 1 tablespoon olive oil into the pan. Add gnocchi and cook on each side until golden, then remove. In a skillet saute the minced onion and garlic in 1 tablespoon olive oil for the sauce until golden then set aside. Add rest of ingredients for the sauce (except spinach and leave out tapioca flour if you want the sauce to be thinner) to the sautéed onion and garlic. Bring sauce to a low boil and boil for 1-2 minutes, stirring continuously (otherwise the flour will clump in the sauce) until sauce thickens. Then stir in spinach, let it wilt, and add gnocchi. Nutrition Facts Paleo Sweet Potato Gnocchi In Spinach Cream Sauce Amount Per Serving Calories 675 Calories from Fat 423 % Daily Value* Total Fat 47g 72% Saturated Fat 32g 160% Polyunsaturated Fat 1g Monounsaturated Fat 8g Sodium 908mg 38% Potassium 804mg 23% Total Carbohydrates 61g 20% Dietary Fiber 6g 24% Sugars 13g Protein 6g 12% Vitamin A 414% Vitamin C 68% Calcium 7% Iron 17% * Percent Daily Values are based on a 2000 calorie diet.